Thank you to everyone who voted in the 2017 Board Election! The results were announced at the Annual Members’ Meeting at USLC 2017, in Mesa, AZ. We are grateful for and thank them for their service! If you are interested in learning more about running for a board position in the future please visit the Official Documents tab in the Members Area of the website and download the Nominee Packet. We look forward to working with you throughout the upcoming year! A closed Facebook Members page was launched. Advertising was placed in Mother Earth Living and OLA Destinations 2015 publication. Lavender Conference (USLC) and Annual Meeting. The United States Lavender Growers' Association hosts a conference every other year, offered in locations rotated throughout the United States. We are pleased to announce that our USLC 2019 will be held Thursday, January 24 through Saturday, January 26, 2019 in the beautiful historical city of Charleston, South Carolina. Experience the southern charm of Charleston as well as learning and sharing with fellow lavender growers and business owners. Our theme this year is: "Growing Your Lavender Business with Inspiration and Innovation"
Our 2019 conference celebrates the inspiration (the "why") each of us is drawn to lavender and building a lavender business, and the innovation (the "how") that so many lavender businesses have applied to diversify and have grown their businesses to be profitable and rewarding. This conference will inspire you and educate you to continue to innovate and define the business model that makes sense for you. We understand that each of you considering coming to the 2019 conference holds a different level of knowledge and interest, so we have planned the conference to benefit all levels of experience and a variety of topics aimed at building and growing your business; expanding and diversifying your products and services and of course, lavender farming. The conference kicks off with a networking cocktail hour and discussion on Thursday evening and follows with 2 days of intensive, informative, and inspiring speakers and workshops. During the day on Thursday, you can dive deeper and enhance your learning experience with optional all-day pre-conference activities including: “How to start a lavender farm”; “The art and science of distillation,” and a historical/agri-tourism excursion to a local plantation and farm. The conference is also a wonderful opportunity to network and connect with fellow lavender growers, vendors and sponsors around the country. In fact, the sharing and inspiration that comes from fellow attendees may be the biggest benefit of attending the conference. “Thanks again to all the people who worked so hard. It was excellent from start to finish”. Don’t forget to come early or stay later! Charleston has so much to offer that you should consider enjoying the area before or after the conference, as your discount rate will apply 3 days before and after USLC 2019, depending on hotel availability. Are you a lavender grower? 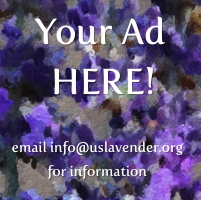 If so, then you are invited to take part in helping us collect very important data about the US lavender industry. The 2014 Harvest Survey is for any and all lavender growers, big and small, whose business is located in the United States. Your participation will help USLGA build a foundation of knowledge to base future measurement of growth and production on.